You never quite know what you might find amongst the Wayne County Historical Society’s collections. While looking for a special item to feature From the Collection this month a thin, flat, brass case about the size and shape of a modern-day smart phone, caught the eye. 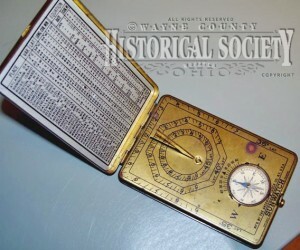 Image of the Sunwatch that is stored at the Wayne County Historical Society in Wooster, Ohio. 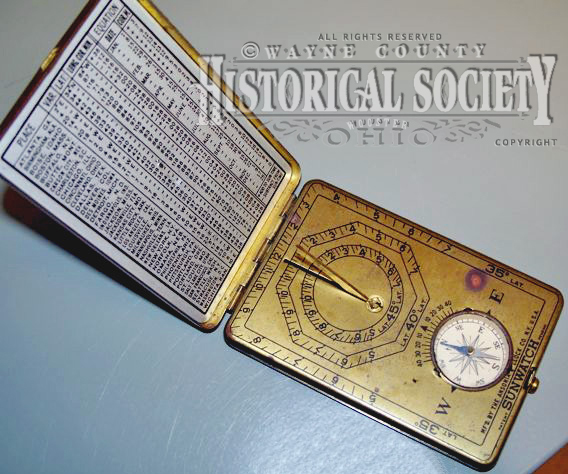 It was tucked away in one of the Wayne County Historical Society’s vaults in a lockbox that among other items contained a shoebox full of antique pocket watches. Nestled in the shoebox full of round pocket watches, the flat brass case was unlike anything else in the box, and begged to be opened. 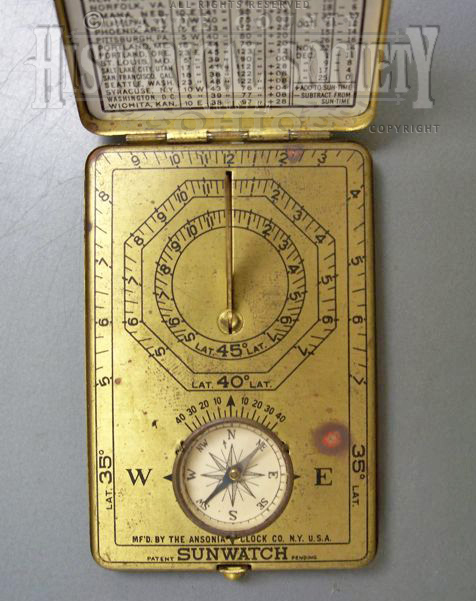 One push on the button catch at the bottom of the brass case opened and revealed a handheld sundial and compass that were supposed to be used in conjunction to tell the time of day. Appropriately named the “Sunwatch” it was marketed as “the tickless timepiece” pocket watch. Granted you never had to wind the clock but how a person was supposed to tell the time on a cloudy day was never addressed. Image of Ansonia Clock Co. Sunwatch baseplate that can be seen at the Wayne County Historical Society. The Sunwatch was manufactured by the Ansonia Clock Company of New York during the 1920s. To use the sundial, you flip open the case and raise the collapsible gnomen to the appropriate angle etched on the side of gnomen for your current location. 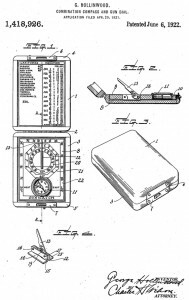 The upper part of the case contains a printed chart listing 42 cities in the USA and their respective degrees latitude, longitude, and clock time in minutes, to add or subtract from sun time. Making the required latitude adjustment is both a visual and a numerical process; the dial provides, through the multi-band structure, the apparent solar time at the latitude indicated by the band. Further visual interpretation yields a second estimate of the time, and the city chart data, provides specific numerical offsets for well known locations. George Hollinwood’s patent filed for the Sunwatch on Apr 20, 1921. Found in Google’s Patent database. According to compassmuseum.com there were five versions of the Sunwatch manufactured over the years. Two for the American market, one for the Australian/New Zealand market, one for the British market, and one for the Canadian market. Depending on when the Sunwatch was manufactured the base plate will show the manufacturer as either: Mfd by Ansonia Clock Co. NY USA, OR Mfd by Outdoor Supply Co. Inc. NY USA, OR Mfd by Sunwatch Manf Co. NY USA. Sometimes the compass embedded in the base plate will show the compass as manufactured in either France or Germany, or no origin is shown at all. 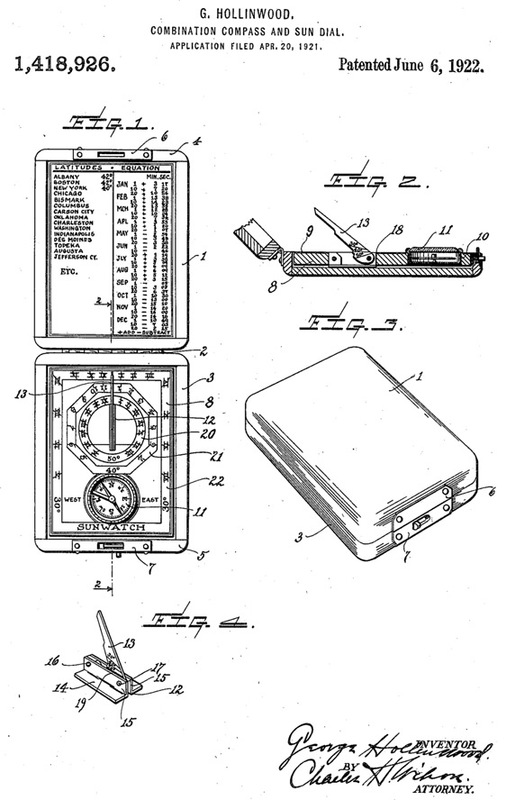 Furthermore, the base plate will show either a “Patent Pending” notation, which possibly indicates it is one of the earlier manufactured watches, or shows a “Patented Apr. 20, 1920 #155244 and May 10, 1921 #1418926.” Turns out the dates and patent numbers printed on the base plate were either fake patent numbers or printing mistakes, as the #1418926 is the original patent number that was filed on April 20, 1921 by George Hollinwood for the Ansonia Clock Co. and granted on June 6, 1922. There are quite a few of these old Sunwatches still circulating as the Boy Scouts of America used many of these types of sundials during the 1920s. Current value of an Ansonia Sunwatch ranges anywhere from $50-$175USD according to the Ebay market place. A warm thanks goes to Dan Shadburn for donating the Sunwatch to the Wayne County Historical Society in November of 2005. I have a sunwatch which says patent pending, apparently acquired while I was a Boy Scout in the 50’s, although it was more likely my fathers. It is missing the instructions- are these available? You might be able to pick up a copy of the instructions on an auction site like Ebay. I have a sunwatch that I have had for many years. Hi, I recently acquired one that is either bone or ivory. I have not been able to find any information on this particular type. Any help would be greatly appreciated. It has Scrimshaw etching for the tables, 3 masted tall ship engraved on the cover, recessed brass compass and brasse sundial arm. It is an absolutely lovely piece. Any help would be appreciated. I have a copy of the instructions and time table. My central stylus seems possibly rusted or stuck in place. So far, I have not rtried hard to unfreeze it. I have a SunWatch but no instructions! I would really appreciate getting the scanned document if you could send it. Thanks! The central “stylus” isn’t. It is a sun dial by which the sun casts a shadow onto the dial below. When you use a finger tip to lift it out, on the side you can set it to 40 degrees. Understood, but that’s my problem – The stylus is stuck in the closed position. Would love to have a copy of the instruction book! Thank you so much. I got A sunwatch with instructions and box it came in were is best place to sell this? I would like a copy of sunwatch instrucktion book please, if at all possible!! Thank you! !